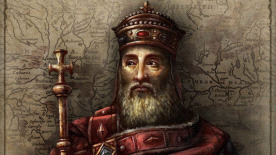 Crusader Kings II: Charlemagne is the seventh expansion for the much praised strategy/RPG Crusader Kings II and introduces the gamer to an absorbing story of conquests of Charlemagne. This expansion moves the game back almost a 100 years to 769 AD and will offer a unique new story driven narrative about the rise of Charlemagne and The Holy Roman Empire. It’s more of what you’ve come to know and love from Paradox Development Studios. Custom Kingdoms and Empires, create a new title from a lower-tier title, can customize flag and name. © 2014 Paradox Interactive™. Trademarks belong to their respective owners. All rights reserved.